Jenin Refugee Camp - Where is Jenin Camp Located? It currently sits on 0.42 square kilometres. Most of the camp's residents came from the Carmel region of Haifa and the Carmel mountains. Due to the camp’s close proximity to the refugees’ original villages, many of the refugees still maintain close ties with their relatives inside the Green Line. 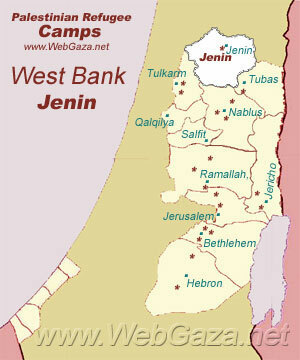 Where is Jenin Camp Located? The Jenin camp was established in 1953, it is located within the municipal boundaries of Jenin. Many of the camp’s residents work in the agricultural sector around Jenin. Like other West Bank camps, it was established on land UNRWA leased from the government of Jordan. All shelters are connected to public water and electricity infrastructure, and nearly all are connected to the municipal sewerage network. The camp came under Palestinian control in the mid-1990s but was the subject of intensive violence during the second intifada. The Israeli army entered the city and camp of Jenin in April 2002, declared them a closed military area, prevented all access, and imposed a round-the-clock curfew. Fighting inside the camp lasted 10 days during which the Israeli army prevented ambulances, medical personnel and humanitarian workers from entering the camp. Clashes led to the deaths of at least 52 Palestinians, of whom up to half may have been civilians, and 23 Israeli soldiers. Many more were injured. Approximately 150 buildings were destroyed and many others were rendered structurally unsound. Around 435 families were left homeless. Even as plans were launched to rebuild the camp and the United Arab Emirates donated land to expand the camp, there were serious obstacles to reconstruction, including regular military incursions, repeated curfews, Israeli closures and Palestinian armed groups’ threats to the project team’s security. The project’s manager, Iain Hook, was shot and killed by an Israeli sniper while in the UNRWA compound in the camp in November 2002. Around a quarter of residents are unemployed, affected by reduced demand and increased debts.